Robots that look like oversized hockey pucks, dune buggies or refrigerators may be practical for cleaning floors, exploring Mars or dispensing beer, but it’s the walking robots that capture our imagination. The trick is making them use their legs to walk efficiently, not like stiff-legged metal monsters out of a 1950s B movie. A new computer simulation by a Vermont researcher shows how robots might learn to walk better by starting on their bellies, the same way animals evolved. For the simulation, Josh Bongard created virtual robots that could change their shapes over time. The robots started with snakelike bodies. 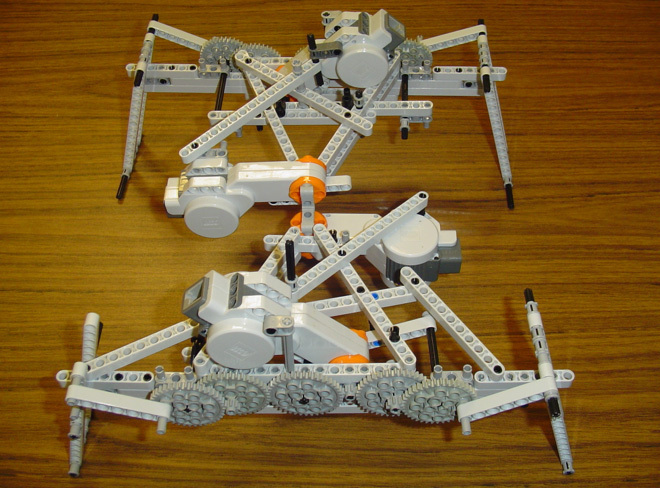 His simulation applied different movement algorithms to the robots’ segmented spines. If the algorithms were successful at moving the robots closer to a target, they’d be used in the next iteration. If not, they’d be thrown away. Full gallery (with 13 images): Robots Evolve More Natural Ways of Walking | Gadget Lab | Wired.com.